THE CAVES OF CALAVERAS COUNTY. and pay a visit to the natural caves. These caves are situated on McKinney’s Humbug, a tributary of the Calaveras River, about fourteen miles west of the mammoth trees, sixteen miles south, by the trail, from Moquelumne Hill, seven miles north, from Murphy’s Camp, nine miles east of San Andreas, and near the mouth of O’Neil’s Creek. 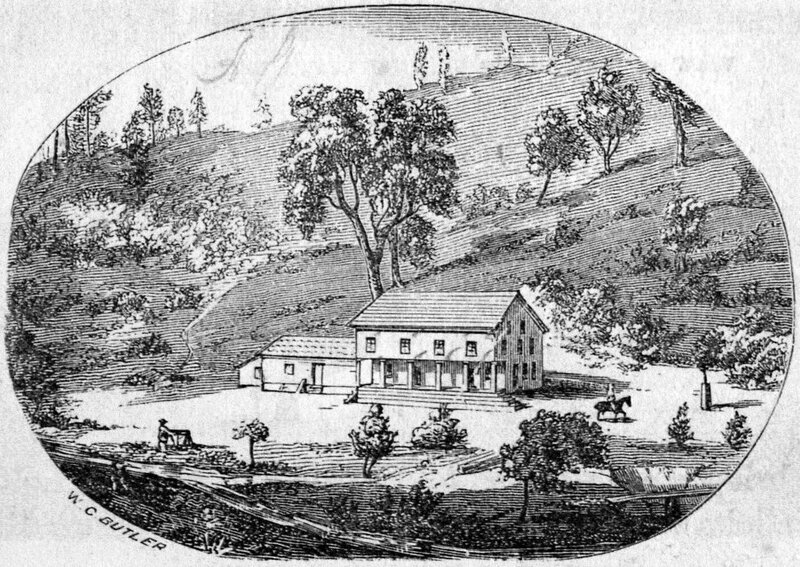 They were discovered accidentally, in October, 1850, by Captain Taylor, who, with others, was engaged in mining on this creek, and who, having finished their mid-day repast, were spending the interval, before resuming their afternoon’s work, in shooting at a mark near the back of their cabin. 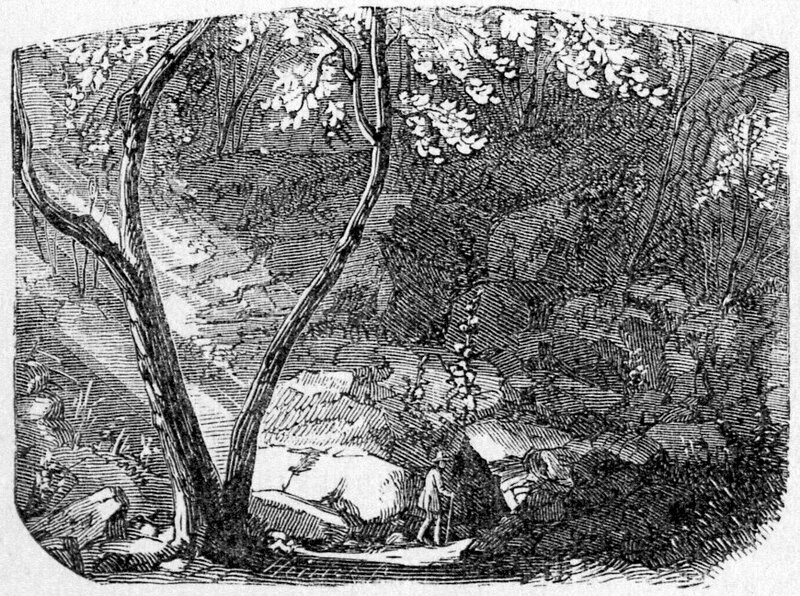 Mr. Taylor, having just fired his rifle, proceeded to examine the mark, and having hit the centre, proposed that it should be placed at a greater distance than any at which they had ever before tried their skill; and was looking out for a tree upon which to place it, when he saw a hole among the rocks. He immediately went to it, and, seeing that the aperture extended into the mountain for some distance, he called to his companions, and they cojointly commenced to explore it. But let us not keep the reader waiting; and as the following excellent description from the Pacific is so truthfully descriptive of this curiosity, we transcribe it for this work. “The entrance is round a jutting angle of a ledge of rocks, which hides the small mining town adjacent from sight. VIEW OF THE BRIDAL CHAMBER. 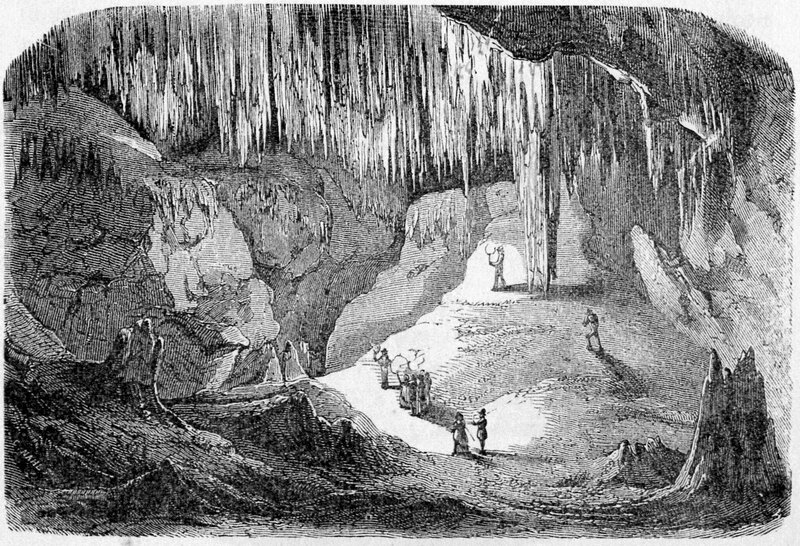 it is so called from the fact, that, on one side, suspended from a singular rock, that has the character of a musical sounding-board, hang a large number of stalactites, arranged in a line very large at one end, and gradually increasing in size toward the other, so that, if with a rod you strike the pendents properly, all the musical tome, from a common bass to a very high key, can be produced in perfection, ringing loud and clear through the halls, as a well-toned instrument. In 1853 it was taken up, under a pre-emption right, by Messrs. Magee and Angel, who erected a large and substantial hotel adjoining the cave, for the convenience of the public, at a cost of about four thousand five hundred dollars. This hotel is commodious and comfortable, and we shall long remember the enjoyment of our visit, and the personal attention we received from the agreeable and enterprising proprietors. VIEW OF THE HOTEL AT THE CAVE.